The L1 open reading frame (ORF) is the most conserved gene within the HPV genome, and has been used for genotyping and identification of new HPV genotypes over the past decades. The MY09/MY11 consensus degenerate PCR primers have been shown to be able to amplify a 450 bp segment of almost all clinically relevant urogenital HPV DNAs in this region. The HiFi ® DNA nested PCR primers target an inner strand of the first MY09/MY11 PCR product for a second amplification to prepare the template for accurate HPV genotyping by direct DNA sequencing. 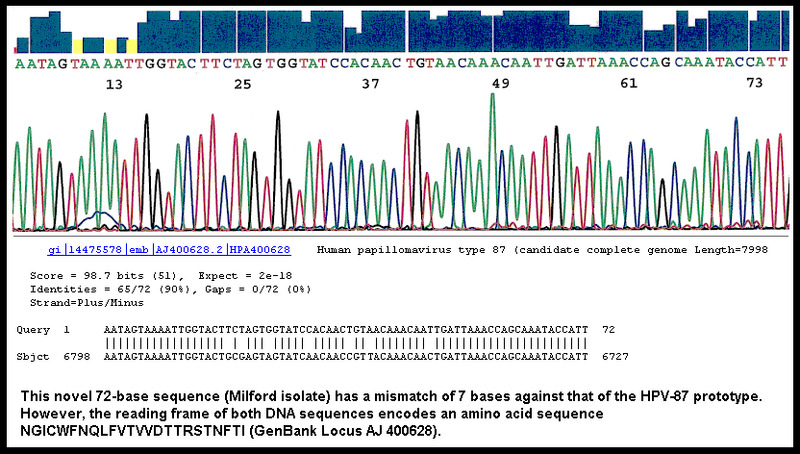 The base sequence is sent on-line to the NCBI (National Center for Biotechnology Information) for alignment against the Genbank database via BLAST algorithm. A 100% match between the patient DNA sequence with a signature sequence stored in the Genbank establishes the unequivocal HPV genotype detected. Here are some of the common HPV types encountered in New Haven County, Connecticut and their signature sequences for the interest of the readers. The patient and the physician can use the BLAST algorithm (under Database Search Set select OTHERS [nr etc.]) to check the accuracy of the HPV genotyping reported by a laboratory.